Here's a really nice sounding collection from the early days…..In 2003, Corey, Eric, and James started holding weekly jam sessions in search of a bassist & drummer. During our very first session, we wound-up meeting bassist Ryan O'Connor and immediately hit it off. 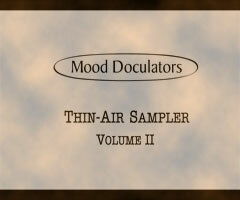 The following "Thin-Air II" collection chronicles highlights culled from hours of free-form jamming recorded with various drummers over a five-month period between 2003 - 2004. Each jam has been cropped down to its best two - three minutes, so there are very few lulls in the action. Interestingly, the overall sound remains incredibly unified despite having a different drummer on nearly every track. You can even hear future Mood Docs drummer Jayme Arredondo on "Apocalypse" and "Arredondub". Enjoy!